In Argentina in the 1910s, after having five children in the course of her affair with a wealthy married man named Juan Duarte, Juana Ibarguren found herself abandoned by him. 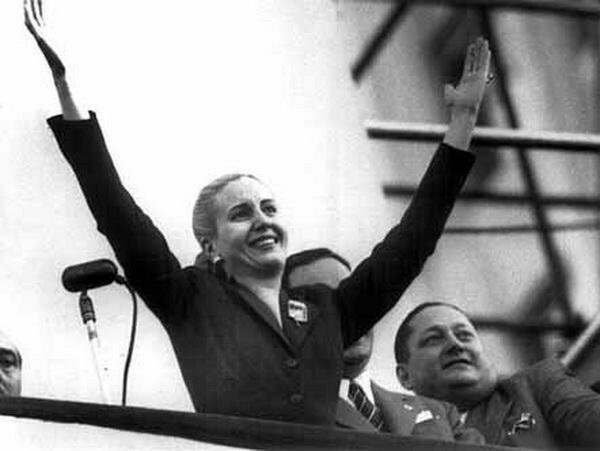 Duarte returned to his legal family permanently when his youngest child with Ibarguren, Eva “Evita” Perón, was about a year old. Duarte had provided the sole means of support for Ibarguren and her children; when he abandoned his second family, all he left them was a document declaring that the children were in fact his. While that allowed them to use the Duarte surname, it provided little else. The mother had to take matters into her own hands. She made a meager living as a seamstress. When Duarte died, she moved her family to a larger town, where she continued to work as a seamstress, but also took in boarders and cooked. Ibarguren had her plans for Perón, who was considered exceedingly beautiful and talented; the hope was that Perón would boost the family’s finances by marrying a rich local bachelor. Instead, Perón set out to become an actress. She succeeded, then upped the ante by marrying the president of Argentina. As first lady, Perón became known for her campaign for female suffrage, her support of organized labor, and the social welfare program she organized. Having experienced grinding poverty and hardship firsthand, she had empathy for those who suffered. Perhaps thinking of her own mother, she is famously quoted as saying, “I demanded more rights for women because I know what women had to put up with.” Peron’s life was cut short by cancer at age 33; her fame endured thanks in part to the award-winning Andrew Lloyd Webber musical, Evita, later made into a motion picture starring Madonna.